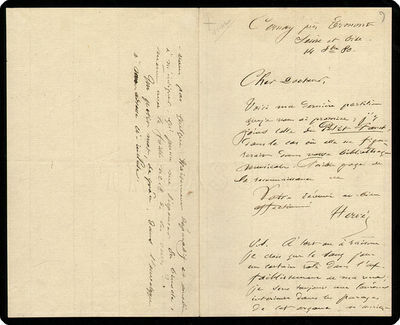 Autograph Note Signed (Hervé) to "Cher Docteur, in French. by Hervé [i.e., Louis Auguste Florimond Ronger]. Cernay prés Permont, Seine et Oise, France, 14 October 1880. 12mo (18 cm; 7"), 2 pp..
Hervé, a French conductor, composer, and librettist credited by some with inventing the genre of operetta, writes that he sends his latest score and also that of Le Petit Faust (neither present). He adds that he is having vision problems and asks the doctor to suggest something that could rid him of his bifocals.